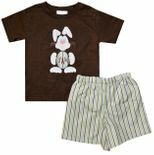 Hop into our Collection of Children's Custom Easter Clothing and Choose a Personalized Easter Outfit or Dress for Your Little Girl or Boy to Wear for Church, Pictures with the Easter Bunny, Parties and Especially Easter Egg Hunts! Easter is the time of the year full of love, hope and re-birth. And, for kids, it is also the time for the Easter Bunny! He or she will love a dress or outfit with Easter Eggs or bunnies personalized with just for them with their name or initials. The Easter bunny will know just whose treats are whose! Everyone will get the Golden Egg.